A new platform launches. The platform needs users and growth. So the platform offers an API for developers to make super-cool apps and services. Why bother developing the innovation in-house when you can have other outside people do it for you? Third-party developers get excited about the API, because it lets developers access the platform’s information and present it in new helpful ways to everyone. Things like, a developer can make a service that offers analytics on traffic and users. Six years ago, third-party developers using Twitter’s API offered a plethora of ways to get information about your Twitter followers. And ways of finding new followers. It was great! Third-party developers can create alternative ways of presenting the content. I personally don’t like how Instagram makes you scroll scroll scroll through full-screen images. I’d much rather have my feed be offered in quicker squares. Third-party developers like web.stagram.com made this possible. This allows great life and growth. It attracts more users, because you aren’t stuck with the one-way presentation that platform offers. The platform gets more users because of all the cool things you can do with the developer’s work. The platform has millions of followers. Yaaaay! Everyone is happy. But wait. The platform gets greedy and doesn’t want any traffic to these third-party services. The platform wants ALL the traffic. The platform cuts away at the API that allows the third-party developers to access data and content. Less and less apps and services can run on the platform’s API. The third-party services have to shut down. As the third-party services end, the platform actually grows. Users are forced to use the official app–and only the official app. We’ve seen it happen with Twitter. We’ve seen it with Facebook. And now we see it with Instagram. Twitter screws over the people who helped their platform grow. Facebook did the same thing. And now Instagram is closing off their API to developers. These platforms have every right to do this. It’s their platform. They can close it off at any time, in any way. It’s a jerk-move. I hate it. Facebook, Instagram, and Twitter are over-controlling. Don’t let anyone else provide helpful ways to use your service. They want you to use their platform only in the ways they exactly prescribe. They kill innovation. They kill community. They kill entrepreneurship. 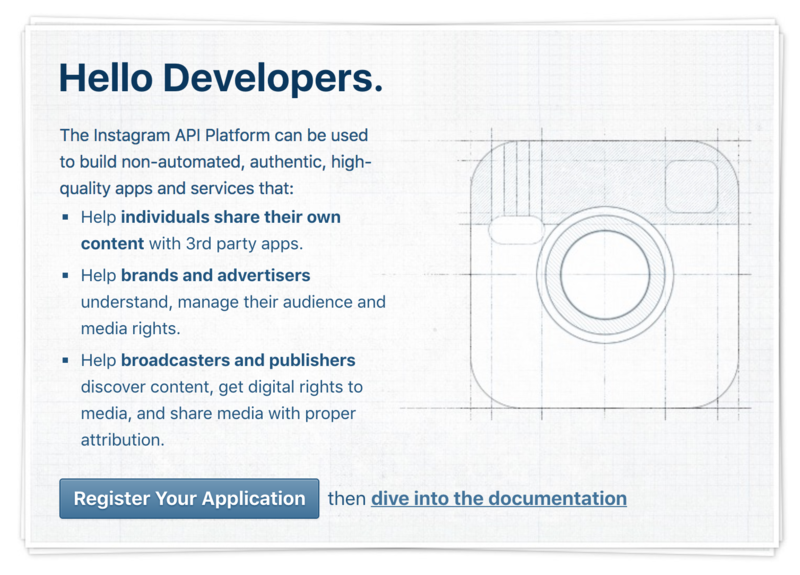 That image in my blog post is a screenshot of what Instagram CURRENTLY has on their developer site as of right now. Here is Instagram totally screwing over developers by limiting their API calls. And they dare to have this promotion welcoming new developers to their service? Hard to make a “high-quality” app when you can’t even make a decent amount of API calls to their service.